Another Bundesliga season begins with the looming prospect of a repeated Bayern Munich win; however, this Bayern side has changed over the previous months. With many of its starters aging and having seen a reasonable challenge last season from RB Leipzig, the defending champions have accepted that change needs to begin before it is too late. This is not new as in the previous season new faces were brought in but not necessarily successfully integrated (Sanches). This year, they kept the manager (Carlo Ancelotti) to provide a good stable atmosphere around the club but brought in some new faces. Tolisso, Rudy and Sule all started in the first game of the season while Gnabry was loaned out to Hoffenheim. Bayern Munich faced Bayer Leverkusen in this opening game, a team who have been consistent in their place amongst the elite of German football. That is until they finished 12th in the 2016/17 under Roger Schmidt, who had brought them to a 3rd placed finish the year before. Schmidt was forced to move on so Leverkusen brought in the surprising option of Heiko Herrlich. You are forgiven if you don’t recognise the name as his experience as a first team manager is limited to the German third and fourth division. He has managed Germany at under 17 and 19 level as well as Bayern’s own youth team. Herrlich’s first game sees him return to Munich with a very talented team who could prove capable under the right coordinator, even if they have seen some of their best players depart (Toprak, Hernandez, Calhanoglu). As expected, Bayern’s method of retrieving the ball was to play high up the pitch and pressure intelligently. This was not accomplished in the gegenpress’s ‘hunt as a pack’ model but was focused on limiting passing opportunities forward. The Munich team would cover the opposition’s options and then send one player to pressure the man. Leverkusen like to play out from the back so this kind of pressing can be effective in forcing the opposition to put themselves in danger when trying to accomplish the team’s main method of attack. Munich were also keeping a defensive system when attacking so that they would not be countered, this system relied heavily on their midfielders. Vidal and Tolisso would have to plug the gaps which both Alaba and Kimmich left when moving forward. Both midfielders had to be disciplined as leaving their position at the wrong time would see Hummels and Sule (not the fastest players) exposed. It was not unusual to see clearances and second ball being picked up by the central midfielders who remained deep. With this area of the pitch covered, the fullbacks were then able to push as far forward as they wished without feeling that they were not doing their job. This system was also meant to help Munich transition to attack quickly by giving the defence a fast and safe route to the attackers. As Munich enjoyed attacking through the flanks and the midfielders were usually positioned between the centre backs and fullbacks/wingbacks (who were in advanced positions). This natural positioning meant that Munich could get to the wings as quickly possible. 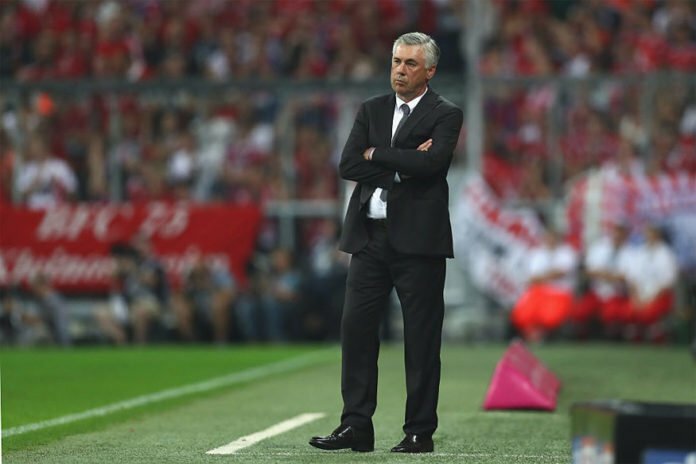 The speed was important for Munich in attack because Ancelotti wanted to play at the fastest possible pace they could manage. For one thing, this would not allow the opposition to settle and would also mean that Munich needed to commit fewer men to the attack to succeed. Essentially, they wanted to suffocate Leverkusen with their talent which was prominent on the left wing. The team could build at a slightly leisurely pace but when entering the opposition’s half of the pitch they would begin playing as direct as possible. Muller drifted around the right half space and right central zone looking for space and attempting to support Lewandowski who looked lonely at times. Rudy was mainly used as an Alonso-esque playmaking between Vidal and Tolisso, often providing the central passing option for centre backs. The fullbacks for Bayern were extremely important as they would be used to keep the Leverkusen defence moving even if Munich retained the ball, either by overlapping their winger or providing a cross field pass to the opposite full back. Leverkusen would try and deploy a gegenpress on Munich high up the pitch but were inconsistent with its use and were too willing to retreat into their own half when dispossessed. His meant they would attempt to retain two banks of four in a tight and compact manner without pushing out against Munich too much. Instead they allowed Munich time to build up when in their half, more concerned about marking attackers out of the game Herrlich does not question Munich’s technical dominance which explains the system but the team still seems caught between this and a gegenpress at times. The wingers are an obvious outlet for Leverkusen with so much pace from Bailey and Bellarabi. Each meant to take advantage of the Munich fullbacks wandering with the counter attacking football. The wingers would attempt to pass their way past the Munich defence instead of directly running at them after entering the final third. This does explain the team selection, as Kampl is not defensively sound in comparison to Kohr and Brandt can’t offer the ridiculous pace of the wingers. Bailey often swaps with Mehmedi when the ball is the right side of the pitch as Leverkusen try to overload the Munich defence with the pace Bailey and Bellarabi possess. Leverkusen’s fullbacks played fairly deep but did move forward if Leverkusen ever established consistent possession. It only took 9 minutes for Munich to get their first goal of the season and on top of that it was assisted (Rudy) and scored (Sule) by debutants. Maybe it’s unsurprisingly as Rudy should be used to finding Sule from set pieces but it also helps that Leverkusen did not place a competent marker on the 6’4” centre back. In the opening interactions of the game Leverkusen’s defence looked quite fragile as they were unable to keep their team compact as Munich attacked. The Leverkusen midfield were also not protecting their backline adequately as they were often overloads on the wings. The team being stretched and slightly undisciplined is not a horrible problem to have during the first game of the season as Herrlich can easily deal with the problems as he progresses. Leverkusen’s lack of defensive discipline would probably be less obvious against the lower quality sides but against the competent and direct attackers it becomes easy to pinpoint. What could be a more concerning problem is that they have some counterattacking threat but could lack a potent finisher. Volland missed some chances and did not have the best touch while Mehmedi was not having the biggest impact on the game from his wing position. However, Munich’s plan was working in the beginning of the game. They had accurately predicted that Leverkusen would try and take advantage of Bayern’s fullbacks but would be forced to more inside, making Vidal and Tolisso’s positioning useful most of the time. Rudy was doing fairly well in his position (doing his best lethargic Alonso impression) as he kept the transition phase moving when retaining the ball. For me he looked a little out of place in the role at times and lacked ideas, he was unable to really pick out brilliant passes but his nice delivery for the first goal will help him feel good about the performance. (This opinion may be contrary to what the Bayern fans think as the post-match thread suggests most think he was good on the day). It did not take long for Munich to score their second giving their third debutant a place on the scoresheet as Tolisso heads a Vidal volley into the net. Leverkusen were not heavily at fault for this goal but could have remained on their men and looked alive until the danger was clear. Vidal’s pass was brilliant though. Despite being two goals up in 20 minutes Bayern were not having the perfect game as it only took Leverkusen accurately pushing the defence with a gegenpress to unsettle the Bayern system. Leverkusen had two decent chances up to this point in the game which could have put them back in contention. This weakness was displayed through two parts of their plan. First, Bayern’s defensive midfielders and centre backs were sometimes their only men back and the midfielders were not wide enough, creating a crowded area of the pitch. This meant that there were fewer men necessary to cover and a smaller area to press which is preferable for Leverkusen. Second, due to the curved shape that the Bayern line would take when having to defend counters they were vulnerable to good runs in behind, which Volland was able to provide. What Bayern could actually look like when trying to build play (the team was built to have good passing options with their positioning but could end up cluttering the defence centrally). To compare it to Leverkusen, Bellarabi and Bailey would find space to attack Munich but would not be able to break the defence so they would pass centrally and slow the game down until Munich would gather. This left Bayern an easy option for dealing with the attack as they weren’t worried about Volland aerially dominating Hummels and Sule or seeing Vidal or Tolisso lose too many battles centrally. Leverkusen could look dangerous in attack when playing with freedom, as Bailey and Bellarabi were linking up when Bailey shifted over to support. This movement into the centre often saw Bailey removed from a Munich marker and providing the possibility of taking advantage of any pockets of space in the centre but the link up play was sometimes inaccurate or unproductive. Herrlich changes the team for the better at half time and must have given the squad a good team talk as they look like a different team. Leverkusen move further up the pitch and begin putting on a more consistent press. This prevents Munich from being able to easily move the ball up to the fullbacks and sees the Munich midfield outnumbered and unable to cope with the pressure. With this, Munich could face 3v4 counter attacks which became more intimidating than the half chances from before. Rudy should have begun helping his teammates in the defence but the same argument can be made for Tolisso or Vidal who were both unreactive to Leverkusen’s changes. Munich responded with a deeper line as they were pushed back, still trying to press a free-flowing Leverkusen. Munich were not brilliant at counterattacking as Ribery and Muller were not suited to that style but it still resulted in a goal. It came from a VAR decision as Aranguiz fouled a Munich attacker who went down easily but it remained a foul. It was a stupid decision as Lewandowski was not in a dangerous position when receiving the ball, despite that Lewandowski was able to notch his first of the season with the penalty, unsurprisingly. Leverkusen still looked dangerous despite being 3 goals down. The passing was suddenly more intelligent as most of the players used two touch football with a more direct passing style (from the 50th minute you could probably track that most of the Leverkusen players were only touching the ball twice or three times before passing). Along with this Leverkusen were playing with fluid attacking positions, meaning that it became harder to follow the attackers. With the direct movement forward, all attackers participating in the attack and Munich’s pinned back, Leverkusen were making genuine opportunities. Additionally, while Munich were compact horizinally, vertically there were not squeezing the players in between the lines which any of the midfielders could have done (usually the job of a designated DM). Mehmedi’s goal may also signal why he could move to the wing in the first half as Herrlich wanted a late runner who could offer a goalscoring threat that Bellarabi and Bailey would not. Brandt was important to the way that Leverkusen was now playing after being brought on for Bailey. He found better positions, created good runs and made passes which developed the Leverkusen attacks. Munich were being unable to answer these issues in their current system. In the final 20 minutes of the game Ancelotti finally decides to pull his team back and prevent his fullbacks from being quite so attacking. Bayern became a conventional 433 now protecting their centre backs out wide and centrally with additional bodies readily available. The game becomes more even as its fair to say that both sides sparred with each other but neither had a knockout punch left. Lewandowski could have ended the game and Coman looked bright but neither could put the game to rest. Leverkusen sadly reverted to the indecisive passing with little thought to how they would break the break Bayern defence. This closed out the game. While Munich created a three-goal gap between themselves and Leverkusen, it was not a perfect performance by any means. As mentioned, Rudy did not look natural in his role despite having plenty of room to orchestrate the play. Sule had a good game all around but Tolisso had a mixed bag. Tolisso was a compentent attacker and transitioned between defence and attack well but he became overwhelmed and unreactive when Leverkusen picked up their play. At the end of the day Munich should be happy with the game as they won by two goals and did dominate most of the game. It will be interesting to see if they are again successfully challenged in the league while evolving their team as defensive weaknesses are present. Herrlich’s vision for Leverkusen may have been seen in the third quarter of game as it was their most impressive period. On another day, they put away their chances and trump Munich but on another different day maybe Lewandowski converts his hat trick, dealing in hypotheticals can misleading in football. The way Leverkusen began the game could be just as close to what we see from Herrlich throughout the rest of the season, hopefully not. Herrlich showed his ability when he changed some things at half time and really challenged Munich but he will hope that he can create a more consistent performance as the season goes on.